At the swanky airport building there is no indication that Ahmedabad is under siege, despite the fact that, on Saturday, 17 bombs exploded within minutes of each other, killing dozens of people. Four of those bombs struck hospitals in the city. Only after driving into the city itself does one appreciate the enormity of what happened here. Lorries full of paramilitary forces, police patrols and checkpoints are everywhere. It feels like the city is going to war. Ahmedabad is in complete shock. Police vehicles are the main moving objects on its wide streets - residents are staying indoors. But the city's hospitals bear the marks of the bomb attacks. The foundations of the Civil Hospital, one of the biggest government medical establishments in the country, were shaken on Saturday evening when two bombs went off in quick succession, killing 15 people on the spot. The deputy superintendent of the hospital, KN Meheria, is still shaken. He was inside the trauma ward attending to the wounded in the previous blasts when the two bombs exploded. "I have never seen bombs going off in hospital," he says, shaking his head. "There was a deafening sound from just outside the hospital, when I came out I saw flames leaping out of the vehicles parked just outside the trauma ward." Laxman Dev Chudasma is one of dozens being treated for injuries following the blasts. "I was carrying a man who was badly injured in the first round of blasts," he says. "Just when I was entering the hospital gate there were explosions and then I saw people running away in shock. "I lay on the ground, but I knew I had been hit by shrapnel." Mr Chudasama does not know what happened to the man he was taking to hospital. 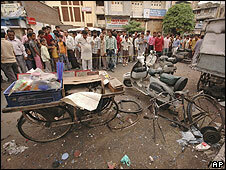 Bharat Bhai was badly burned in the explosions. "My clothes were on fire," he says, still writhing in pain. "I have burn injuries all over my body." The wounded men and women have been put in a large hall, which is crammed with their relatives and friends. Medical staff run from one end of the hall to the other depending on who needs more attention. The relatives of the injured are angry, very angry. One of them says foreign hands are out to destabilise the country. He says Indian Muslims are being used to carry out the attacks but the plans are being made outside India. His sentiments are echoed by many in the hall. There is palpable tension in some parts of the city. 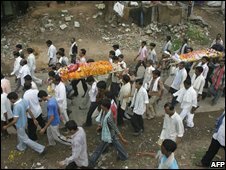 Six years ago it was in Ahmedabad that many Muslims were killed in violence which was seen as retaliation for the killings of about 60 Hindu pilgrims in Godhra, Gujarat. Muslims now fear there might be retaliatory attacks against them. But so far there are no signs of a backlash. State chief minister Narendra Modi and other leaders have appealed for calm and it seems people are listening. The police headquarters look like a garrison. Units of the Rapid Action Force are on standby here. The city's joint police commissioner, HP Singh, says they still did not know who was behind these blasts or their motive. But investigators are working on leads, following the discovery that the registration numbers of the two vehicles used in the hospital attacks were fake. Mr Singh confirms that an e-mail sent to some media outlets five minutes before the blasts originated in Mumbai (Bombay). The anti-terrorism squad in Mumbai has since raided several places where they believe suspected militants could be hiding.